The good news? Like most rock or movie stars, there's nothing fundamentally wrong with California. It's still talented, and retains great physical gifts. Our climate, fertility and location remain without parallel. The state remains pre-eminent in a host of critical fields from agriculture to technology, entertainment to Pacific Rim trade. California can come back only if it takes a 12-step program to jettison its delusions. This requires, perhaps more than anything, a return to adult supervision. Most legislators, in both parties, appear to be hacks, ideologues and time-servers. This time, when the danger is even greater, we see no such sense of urgency. Instead we have a government that reminds one more of the brutally childish anarchy of William Golding's 1954 novel "Lord of the Flies." 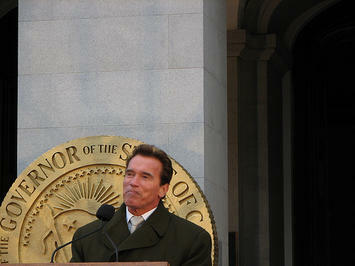 Arnold Schwarzenegger has not turned out to be that supervision. Rather than the "post-partisan" leader hailed by the East Coast press, he has proven to be the political equivalent of the multi-personality Sybil. One day he's a tough pro-business fiscal conservative; next he's the Jolly Green Giant who seems determined to push the green agenda to a point of making California ever more uncompetitive. Contrast this pathetic performance with what happened after our last giant recession in the early 1990s. At that time, a bipartisan coalition of leaders – Speaker Willie Brown, State Senator John Vasconcellos and Governor Pete Wilson – worked together to address what was perceived as a deep economic crisis. They addressed some key problems and brought the state back from the brink. California recovered smartly between the mid-90s and the new millennium. Overall though, things are worse now. California has been flirting for the past year with its highest unemployment rate since the Great Depression. The last time we could blame the end of the Cold War for much of our economic distress; now the problem is a more broadly based, largely self-inflicted secular decline. A bloated government is part of the problem: Between 2003 and 2007, California state and local government spending grew 31 percent, even as the state's population grew just 5 percent. The overall tax burden as a percentage of state income, once middling among the 50 states, has risen to the sixth-highest in the nation, says the Tax Foundation. Even worse, the state is getting ever less benefit from these revenues; since the Pat Brown era the percentage of budget spent on basic infrastructure has dropped from 20 to barely 5 percent. Although these taxes are often portrayed as "progressive," California has continued to become more socially bifurcated. Our ranks of middle-wage earners are dropping faster than the national average even as the numbers of the affluent and poor swell. Overall California's per capita income, roughly 20 percent above the national average in 1980, now barely stays with the national average. When housing and other costs are factored in, Los Angeles, San Francisco and Fresno rank among the top five major urban areas in America in terms of percentage of people in poverty, according researcher Deborah Reed of the Public Policy Institute of California. Only New York and Washington, D.C. do worse. At the root of these problems is an increasing lack of economic competitiveness. An analysis of the economy made for the Manhattan Institute shows California losing its edge in everything from migration, income, jobs and in entertainment industry employment. Tech companies may cluster in Silicon Valley but many are sending their new jobs abroad or to other sites. Recently, several leading Bay Area firms – Twitter, Adobe, eBay, Oracle and Adobe – have established major new operations in the Salt Lake area alone. So how do we turn it around? First, let's find some adults, like former Speaker Robert Hertzberg or GOP financer Gerald Parsky, who know what it is to run a business and comprehend that the economy actually matters, and get them to head up a commission on the economy. Second, our leaders and policy elites must engage the emerging new business leadership of the state, which is increasingly immigrant, Asian and Latino. Right now neither party seems focused on the state's future besides enriching their core constituencies. Lower taxes – the favored strategy of the right – on the already wealthy reflects an understandable desire to preserve one's asset but is insufficient as a strategy. Democrats meanwhile seem determined to defend public sector pensions, Draconian labor, the high-speed rail boondoggle and environmental regulations, no matter what the cost to the economy. However contradictory their sound bites, the established parties are each following a script that would assure the next generation of Californians – largely Latino – remain an underclass that will have to move elsewhere to reach their aspirations. The left would do it by killing jobs in such fields as agriculture, manufacturing, construction and warehousing. As Robert Eyler, chairman of the economics department Sonoma State puts it, "the progressives have become the regressives." For their part the GOP would kill the new California by starving it. They have no plan to bolster the basic services – like community colleges, roads, water and power systems – that will allow future working-class Californians to thrive. Their interests ignored by the parties, the immigrants and their offspring still represent the very key source of demographic energy and entrepreneurship that can revitalize the state. If you still want to see hopeful stirrings in California, go to places like Plaza Mexico in Lynwood or the new Irvine center recently built by the Diamond Development Group. Appealing to young families and distinct tastes, these retail facilities have thrived as the rest of the state's overall retail economy has declined. More important still are the companies started by immigrant entrepreneurs like John Tu, CEO of Kingston Technology or scores of smaller Asian-owned firms in places like the San Gabriel Valley. Since the 1990s, newcomers have launched roughly one in four Silicon Valley startups. Add to this the muscle of the emerging Latino economy, led by food processing companies like the Cardenas Brothers, who now provide Costco with its frozen Mexican food. Due to their strong family and cultural ties in California, such ethnic firms appear less likely to move than more Anglo-dominated companies. But if the state keeps eroding public services and adding new regulations, these firms – like their counterparts in Silicon Valley and elsewhere – will place most of their new jobs as well in Utah, Texas or overseas. What we have here, in the end, is a massive disconnect between economics and politics. Does anyone in Sacramento talk to or even know about the largely Middle Eastern-led L.A. fashion industry? Is anyone talking to the hip sportswear mavens of Orange County's own "Velcro valley"? Or what about agriculture, our traditional ace in the hole, which is largely disdained by the state's intellectual and media class who see in large farms the work of the corporate devil? Somehow these productive voices – essential to our comeback – must be placed at the center of the debate. Sacramento's leaders need to talk not just to lobbyists but to the key job-creators. These are the people who, even in hard times, are showing how we can grow an economy based on our natural advantages of climate, ethnic diversity, entrepreneurship and location. Ultimately we must make the creation of new jobs a priority that goes beyond formulaic mantras about lower taxes or illusory, state-supported "green jobs." With a return to growth, California can still address its basic problems and challenges. But first we must corral the ideological hobbyhorses now running wild through Sacramento and make the needs of job-creators the central issue for our policy-makers. This article originally appeared in the Orange County Register. Submitted by zion1122 on Tue, 08/20/2013 - 06:01. Submitted by john17nider on Tue, 08/06/2013 - 01:47. Submitted by robert1122 on Wed, 07/31/2013 - 05:02. Submitted by john17nider on Mon, 07/08/2013 - 04:56. Submitted by john17nider on Sat, 06/22/2013 - 10:57.